Straight Arrow is very pleased to bring you this rare concert recording from Elvis’ Summer 1971 festival. It is always a delight to find new, fresh tapes from this year, and from this particular season -- especially when it's in very good sound quality. This is an excellent recording of the August 28th dinner show. Elvis' previous engagement there had shown signs of his high performing standard slipping, but here he sounds like he's back on track again. Late August shows are tight, no-nonsense affairs with Presley in good voice and in strong form. He performs with focus and professionalism, and he sings a fantastic variety of music. The Las Vegas, August 28th, 1971, Dinner show is previously unreleased. The only existing tape/CDR in circulation is of very poor quality. Our release has been taken directly from a recently obtained first generation copy of an original audience-recorded cassette. This concert was recorded by an Elvis fan from France, Marie Chantal Rivière, who also taped other August 1971 Las Vegas shows. We have released Marie Chantal Rivière's recordings of the August 27th & 29th dinner and midnight concerts on the 2CD “Solid As Rock” (SA/SP 2015-37-02) and the CD “Last Stint At The International” (SA/SP 2016-38-02). If you like those releases, you cannot go wrong with “He’s The One In ‘71”! 01. Orchestra Intro - 02. Introduction: Also Sprach Zarathustra - 03. That’s All Right - 04. I Got A Woman - 05. Proud Mary - 06. Sweet Caroline - 07. Polk Salad Annie - 08. Instrumental intermezzo / Elvis talks - 09. Johnny B. Goode - 10. It’s Impossible - 11. Love Me - 12. Blue Suede Shoes / Whole Lotta Shakin’ Goin’ On / Blue Suede Shoes - 13. Heartbreak Hotel - 14. Hound Dog - 15. (Let Me Be Your) Teddy Bear / Don’t Be Cruel - 16. 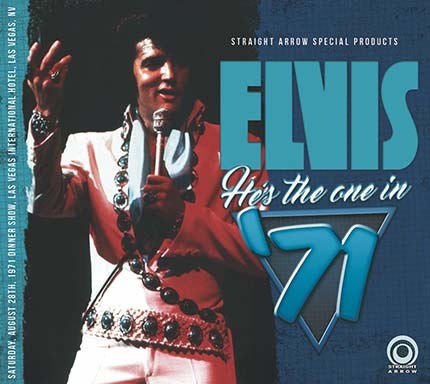 Suspicious Minds - 17. Introductions of singers, musicians, orchestra - 18. I’m Leavin’ - 19. Introduction of Ed Parker - 20. Bridge Over Troubled Water - 21. Can’t Help Falling In Love - 22. Closing Vamp / Announcements.